The Rural Broadband Initiative will get you closer to the world. If you live outside of an urban area you already know your “broadband” doesn’t often live up to that name. The Rural Broadband Initiative (RBI) was created to solve this problem. The RBI is a partnership with the government, Chorus and Vodafone to bring broadband to rural areas. In a similar fashion to the UFB (Ultra-Fast Broadband) roll-out, the RBI is about getting rural homes and businesses connected with faster broadband. And while in a perfect world every home would have fibre, this simply isn’t possible. The RBI's current goal is broadband with peak download speeds of at least 5Mbps (megabits per second) to more than 90 percent of homes and businesses outside urban UFB areas. While UFB is all about fibre, there are a number of ways rural New Zealanders can get hooked up. Copper line ADSL or VDSL: “regular” broadband capable of high speeds. 4G/3G: a fast wireless mobile network. Local wireless broadband networks: fast networks offered in specific areas. Satellite: useful for those out of good wireless range. Fibre: an optical cable that delivers the fastest speeds available. Where you live determines what type of connection you can get and how fast it will be. The National Broadband Map is an online tool that tells you what broadband services are – and will be – available at your address. The map also details expected speeds across multiple connection types, including fibre, copper, and wireless. Regular ADSL or VDSL broadband can be delivered over regular copper phone lines. However, the speed of your connection depends on whether your home is closer than five to six kilometres from an exchange or cabinet. Due to the transmission performance of copper wires, the closer you are to the cabinet, the faster your internet will be. An extra $100 million in funding has been earmarked for the next stage of the RBI. So if the broadband options at your address are limited now, you could be receiving improved broadband in the future. If you are among the 30 percent of homes, farms and businesses lucky enough to be within 800m of a cabinet then you can get VDSL, which is about 20Mbps. But beyond that, it’s ADSL and at the six-kilometre extreme, you’re more likely to get 1Mbps. If you’re only getting those sorts of speeds then you might want to consider wireless broadband. Installing ADSL or VDSL is simpler than fibre, as nearly every home has a telephone line already installed. The main hiccups can be if there are a lot of other homes already connected to your local cabinet. More users also mean more traffic, so your speeds may suffer as a result at peak usage hours. As part of the RBI, Vodafone’s cellular sites are delivering wireless broadband to homes that either can’t get fixed-line broadband or those where the fixed-line is so slow that a wireless option is preferable. This gives you a 3G or 4G connection to your home via an aerial on your roof. 4G network speeds can potentially match fibre (100Mbps) though that’s based on perfect signal conditions. Spark also offers a 4G rural wireless service. If you’re out of range of the 4G coverage, you can probably connect to the 3G RBI network, but the speeds are slower. 3G can deliver speeds of 20Mbps, again this depends on signal conditions. Just like a normal mobile phone signal, speed and signal quality depends on factors such as distance from the cell site, surrounding geography, and the number of users at particular times of the day – the busy periods are between 3pm and 8pm. The aerial that will be installed on your roof is much bigger than the one in your phone. So even if your current phone coverage isn’t great, your wireless broadband reception could be much better. Vodafone and Spark have interactive maps online showing whether you’re able to get RBI wireless broadband coverage. The set-up for wireless broadband is simple but may require a technician to do the work. After you choose a broadband provider, in most cases it will install a directional aerial on your roof, run cabling from the aerial to the supplied modem and that’s it. Like UFB installs, if you require, or want, more than is “standard” (for example if the aerial is on a second-storey roof), you may end up paying more. While Vodafone owns and runs the RBI network, you can connect to it through a different retail provider. If you are nearer a cell tower and can receive a good signal, you could get a “plug-n-play” option. You can check whether you could get this service by going on the Vodafone coverage site and selecting “no aerial” in the Rural Broadband map. If you’re in the odd situation of having good ADSL broadband but bad mobile coverage, Vodafone has a product called Sure Signal. This uses your home broadband line to boost your 3G signal. Vodafone is working on a way of using 4G wireless broadband in a similar fashion to boost your mobile phone’s coverage. There are other providers who operate their own wireless broadband networks in different regions. You can check out what is available in your area by searching for your address at broadbandmap.nz. Fibre offers the fastest speeds but is the most difficult to install. The fibre has to be physically connected from the street to your house, most usually via a trench. It’s rare, but some rural homes and businesses can connect to fibre. This is because fibre has been installed in rural areas to connect schools and hospitals. Chorus has an interactive map online that shows whether you’re able to get fibre. Fibre offers the fastest speeds and is what we would recommend if you are able to get it. 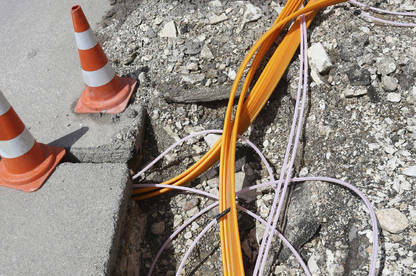 However, it is the most difficult to install, as the fibre has to be physically connected from the street to your house, most usually via a trench. Once you pick a broadband provider, it will work with you to figure out how the fibre will be installed and what the costs will be. Costs are determined by: the density of properties in your area; how far you are from the exchange or cabinet; and how far your home is from the road. This means it’s cheaper to get fibre to a home in a rural township than one on a farm. If you can get fibre, you’ll need some trenching work to get the cable from the road to your home. Chorus say if the trench needs to be longer than 15 metres, then you may wish to do this yourself. There are detailed instructions on how the trenches need to be dug and about the lead-in pipe on the Chorus website. It’s important to read this and have a discussion with your broadband provider before starting the physical work of getting fibre installed. More complex builds require a design and price-on-application approach, to avoid surprise costs. If you’re too remote for all the other options, then you can get a satellite service. Satellite isn’t part of the RBI, and is seen as a last-resort technology as it has some of the highest costs for the lowest data caps and slowest speeds. But if you have no other option and you have room for a large satellite dish (larger than that needed for Sky TV) that has a clear view of the western or northern sky, then it could work for you. Satellite set-up is similar to wireless broadband. You’ll need a technician to come and set up your dish. Once you know what type of connection you can get, contact a broadband provider to set it up. There are multiple providers offering ADSL or VDSL to rural areas. There are six nationwide providers and four regional providers of RBI 3G/4G wireless services; and even more local wireless providers (see "Nationwide providers" and "Regional providers" below). For example, an average 80GB plan on a 3G or 4G wireless network costs about $100 a month (this doesn’t include calling). A similar-sized plan on fibre costs over $90 a month. Satellite is the most expensive. For example, a 4GB plan costs over $90 a month. Results from our latest ISP survey show how respondents from rural areas found their service. We split the respondents into “inner rural” – within 5km of a rural town and “outer rural” – further than 5km of a town. Rural users made up 26 percent of our survey. ADSL was the most common connection for rural users, with 70 percent of inner and 58 percent of outer rural users on it. A third of outer rural users are now on wireless broadband. Rural users were less likely to have unlimited data plans compared with urban users. Rural users pay more than their urban counterparts. A significant amount of outer rural users (16 percent) pay more than $120 a month. Outer rural users were also over-represented among those who experienced regular drop outs/disconnections and slower than expected speeds. Correspondingly, both inner and outer rural users were significantly more likely to be very disappointed in their connection speeds (28 percent and 34 percent respectively). Our final question was: “what is the one thing your ISP would have to provide for you to increase your overall satisfaction score?”. Half of the outer rural users answered: “better service (faster, more reliable connection etc. )” This was also the top option for inner rural users (35 percent) but was closely followed by “More competitive pricing” (33 percent). We have been on the Spark 4g RBI wireless for two years now, we were at the end of a congested rural ADSL line with speeds dropping to dialup. Since moving to 4g our speeds are quite stable at around 20Mbps at about 11kms away from cell site, working well & happy. The Spark Link in the paragraph below takes you to the Spark Mobile site, nothing to do with RBI. A small oversight, perhaps you can correct? "Vodafone and Spark have interactive maps online showing whether you’re able to get RBI wireless broadband coverage." The Spark website shows where different wireless broadband services are available around the country. These may be suitable for homes that either can’t get fixed-line broadband or the fixed-line is so slow that a wireless option is preferable. Vodafone took the money and upgraded their existing 3G coverage to 4G. They told us we'd NEVER get mobile broadband where we are - 30km by road from Masterton and just 15km from the local school which has fibre-UFB available. Last year, we were told we had to have a smart meter (yes, we knew we didn't actually have to have it but we figured maybe - one day and all that) and now it's sitting on the wall trying desperately to find vodafone. The meter reader just laughs! You should have mentioned Wiz Wireless who cover much of the real rural Wairarapa. We're about to sign up as there is a new wireless mast in our area. Speeds seem to be between ADSL+2 and VDSL, but we shall see. Still beats the 512kbs of satellite. We agree with the comments on satellite speeds and cost - but at least we have internet. Big ups to Wireless Nation for their satellite service. farmside were hopeless to deal with. Our phone lines are so flaky that dial-up no longer works on even basic things like email. I know a few people that have hooked up to farmside. Positive side is they are better than dial up, down side is they got huge unexpected bills. Can work out very expensive. One paid for repeaters solar panels etc to get wireless in. Shared the cost between neighbours. Now very happy. We live in rural south west Auckland (Franklin) and we looked at Farmside but we found their costs to be extremely high, we went with Compass Wireless and now pay $70 for 100gigs which is about what Farmside was offering for 5gigs a few years ago. According to the map we get >5MBs download. What this means is that the wire from our house to the cabinet is capable of that. This is true. What it does not show is that 58 properties share 3 x 2MB/s copper lines from the cabinet to the exchange 5km away. In reality we get 144kbs on good days and nothing on Thursday evenings. This has been reported to the authorities who shrug it off. Rural Broadband initiative was a non-event. Nothing changed in our rural area of the BOP. It is only called broadband so the providers can charge more. Like Mark E our data rate is pretty near non-existent after school until very late at night. The rest of the time the data rate may peak at around 230 - 450kbps but it is usually only spiking to that, not constant. Video streaming is a townie thing and a rural joke. Our local cabinet was due for upgrading last June (2015) according to the Chorus/Vodafone map but if it happened at all, then it was a waste of time as there is no evidence that it had any effect. The alternatives are too costly to consider.